After looking at several gyms that were so cheap that it makes you wonder if maybe they are located in someone's basement, I finally made my choice: a nice, clean place with yoga classes, within walking distance from my house. Perfect. Only problem: they only accept payment by UK debit card. Only. A Visa card will not do, advance payment will not do - medieval, I know, but no less true. So, off to the bank I go to open my first UK bank account! 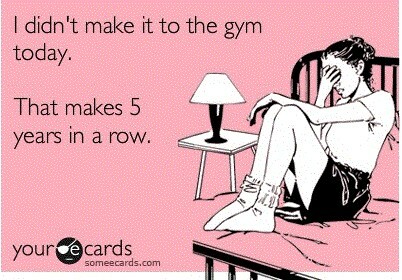 Which, of course, is a million times more difficult than the gym. Matters are made complicated by the fact that I am a) self-employed, registered as a freelance journalist in my home country of Sweden and b) living in a flatshare with NO household bills in my name. This, apparently, means that opening up a UK bank account will be that much more complicated. Hence, until I solve this pickle, no gym membership. Disillusioned, I start looking around for a nice yoga studio. I figured I'd take a daily yoga class and emerge all Jennifer Aniston toned arms and glowing skin, with an air of blissful serenity from meditating every day. Yeah, right. If I were a millionaire, maybe. Who can afford a £120 monthly yoga studio membership? Who? Unless you're actually Jennifer Aniston. I get it, they supply towels. How nice. If I bring my own towel, can I pay £35? Plus, almost all the classes are in the early afternoon, like at three p.m. So not only do you have to be filthy, stinking rich - you also have to be a non-nine-to-fiver. Which leaves me with the conclusion that, this being London, their clients are Gwyneth Paltrow and Madonna. So, at the moment, I work out at home. Which is not lame at all. Actually, it's cool. Just until I can join a gym. Or, you know, become a millionaire. So witty! Who would have thought UK banking system was so complicated... Good luck working out at home. Yes, I was thinking of doing that both at the gym and the yoga center...seems like the only option! Wow!!! That's really annoying. Well, its best that you just exercise at home. It is much affordable and you can do what you want. If you have extra budget, try buying cheap exercising equipment. mi ricordo invece che aprire (e chiudere) il conto in Svezia era stato molto semplice, così come amavo le palestre là. Io mi sono data al running, unico investimento scarpe e abbigliamento invernale appropriato, ma le soddisfazioni e la libertà di andare quando voglio sono senza prezzo! È proprio vero,per fare qualsiasi cosa in Inghilterra devi aprire un conto in banca!Ma non pensavo fosse cosi complicato. Non sapevo che i costi di Yoga costassero così tanto,che prezzi! Leyla, penso che é complicato soprattutto per me in quanto libera professionista...se facessi la cameriera in un pub come tanti dei miei conoscenti, non avrei problemi! Sono al punto che quasi quasi mi trovo un lavoretto extra per potermi aprire questo benedetto conto...o faccio come dice Louise qui sopra e pago a corso! Quando ero a Londra ho fatto una lezione al centro Tryoga...è bellissimo, ma i costi sono piuttosto elevati! Solo una lezione costava 35 sterline!! !